Back in December the WebOS Ports team hosted a virtual hackathon to bring a number of popular and vital webOS homebrew utilities up to modern Enyo 2 standards. Things have been pretty quiet on that front in the intervening month, but last night WebOS Ports developer Josh "@shiftyaxel" Palmer took to Twitter to share screenshots of the progress they've made since. In short, it's Preware, but built with Enyo. It installs homebrew apps from the webOS Nation Homebrew Gallery and WebOS Internals' own feeds, just as you'd expect. The difference is that by being built with Enyo 2 the app now has a more flexible layout. Typical of the Enyo user interface is the display of multiple columns, with a list of apps on the left side and the selected app's info on the right. Overall it looks to operate in a similar manner to the Preware we know and love, though Palmer did note that right now Preware 2 will only support Enyo apps on Open webOS installs, as Open webOS doesn't currently offer support for PDK or hybrid apps. That's not to say that Preware 2 can't support PDK-based apps, an IPK is an IPK is an IPK, after all, and older version sof webOS will support PDK and hybrid app installs just fine. Prompted by former webOS developer relations employee Donald Kirker, Palmer pondered that it would be "feasible" to move app installation to a background tasks in Preware 2, conceivably enabling a user to continue browsing apps while installing apps. Consider that more a possibility for future releases, not a promise. Thanks to its Enyo 2-based status, installation of Preware 2 on varying webOS hardware shouldn't be an issue. Even on older webOS smartphones, the Enyo 2 framework can be packaged with the app at a size under 25KB while still giving cross-platform compatibility and speed. For his part, Palmer's screenshots were taken on a TouchPad running webOS 3.x. Preware 2 is still in pre-alpha stages and not publicly released, though once they're far enough along the app will be released into the alpha testing feeds in Preware. When that will happen… well, WebOS Ports is very clear on their ETA policy: there are no ETAs - when it's ready, it's ready. So hold on, check out the screenshots after the break, and dream of someday going all Enyo for your homebrew fun. WhatsApp for BlackBerry 10 coming this week! Switching to Android. Or not. Introducing the new iMore for iPhone 2.0 app, with comments, landscape, favorites, video podcasts, and more! Fitness Month is over here at Mobile Nations for another year. Health and fitness should be a year-round commitment, and it's never too late to start so if you missed out during February be sure to check back through the blogs and forums for content you may have missed. Hopefully you found some apps or tips to help you meet your fitness goals, or maybe even found some moral support in the community to help keep you motivated. All throughout the month each site was giving away prizes for participation. We announced some winners mid-month, and below are the final results from the remaining contests from across Mobile Nations. If you were participating in the forums or on the blog contests, be sure to look below and see if you're a winner! UberCalendar is an extremely powerful patch in Preware for both webOS phones and the TouchPad that will greatly enhance the capabilities of stock calendar app. 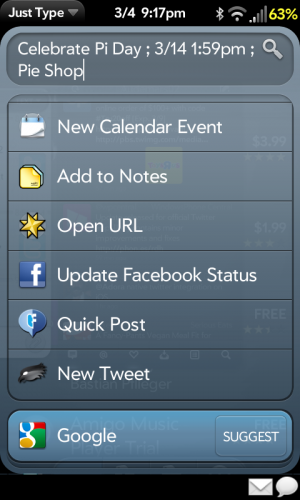 Among those enhancements is the ability to configure a new calendar entry but using the Just Type functionality of webOS. For those that remember Quick Event for webOS 1.x devices, UberCalendar works very similarly. Just by entering text in the format of "Subject ; Date/Time ; Location" and then tapping the "New Calendar Event" Quick Action in Just Type, an new calendar event card will appear for you to add any additional details before saving. Note that you need to use a semi-colon (";") between the three options, and the date/time and the location are optional. Note that if you enter a date or time incorrectly, the entire input text will just be entered as the subject of the calendar entry and you will need to manually set it in the entry. Got an old Sprint Palm Pre or Pixi or FrankenPre sitting around that you'd like to put to work on another network? Turns out that even though, according to the Librarian of Congress' interpretation of the Digital Millennium Copyright Act the unlocking of cellphones is illegal without carrier approval, Sprint is totally on the side of giving you said approval. Sprint announced today in a press release that they have no problem with you using your old Sprint phone on another network - so long as it's one of Sprint's own MVNOs (Mobile Virtual Network Operator). In essence, you can use your old Sprint phone on any network, so long as it's Sprint. The list of MVNOs that ride on Sprint's network is actually more than twenty operators long and includes popular names like Virgin, Boost, and Republic. Sprint's touting the option to use your old Sprint smartphone as the "Bring Your Own Sprint Device" program, taking the initiative to lower "the number of inactive phones in the market, diverting phones from landfills." Also, Sprint gets another paying customer without having to deal with the costs of subsidizing a new phone. A growing portion of the customers on Sprint's networks are on these MVNOs, which typically are of the pre-paid no-contract variety as opposed to the traditional post-paid contract system on which Sprint's network was built. It's worth noting that Bring Your Own Sprint Device, as the name says, only applies to Sprint devices. And that's not just because Sprint hates that Verizon Pre Plus you happen to have sitting in a drawer. While it might be technically possible given the right proprietary bits to reprogram a Verizon phone to work on Sprint or vice versa (we may or may not have be done so with regularity back in the heady day of the Palm Treo), it's a much more difficult endeavour these days. Besides, Sprint wants you to use their phones. Mobile Nations podcasting update: What's new for 2013! Why is there different BlackBerry 10 OS updates happening around the world? LG is buying webOS from HP and they've stated their intentions: smart TVs and eventually other things. But those other things don't include smartphones and tablets, no, LG's perfectly happy with the millions of Android devices they've sold. No need to mess with what's working for them. But what about us, the webOS faithful? What about those webOS-powered smartphones and tablets we crave so? Short of storming LG's Seoul headquarters and forcing them to design, produce, and distribute webOS mobile devices (a long term occupation proposition, no doubt), the best we can do is try to make our voices heard. So you can bombard LG with your requests, send them snail mail (don't forget, postage to Korea is going to take a few more stamps), and sign petitions. The fine folks at WebOS Internals have long been on the leading edge of the webOS homebrew movement. Following the shutdown of webOS hardware development in 2011 and the subsequent exploration of selling webOS somebody other than HP, they put together a handy guide of everything you'd need to know should the back-end services that support webOS go to hell in the proverbial hand basket. Aptly, it's called the webOS Survival Kit. Following this week's news that HP has sold their webOS assets to LG, the webOS Survival Kit is worth linking to again. HP has held on to the cloud services portion of the webOS business unit and thus still holds the responsibility for maintaining the App Catalog and backup services for the active webOS devices still out there. HP hasn't commented on how long they'll continue to keep these services running, though conventional wisdom is at least two years from the last sale date of webOS hardware (which, firesale-wise, was in December 2011). So at the end of this year we could possibly be looking at the end of webOS support from HP as the cloud division refocuses on enterprise services instead. The end is maybe nigh? So there's the webOS Survival Kit. The multi-step guide covers installing Preware, moving your contacts away from your webOS Account, setting up your own local backups, and having everything downloaded and set-up on your computer should the worst happen and you have to restore your Pre, Pixi, Veer, or TouchPad without the support of HP's cloud infrastructure. While some services like the App Catalog and backup will cease to function if HP shuts down the webOS servers, take heart that the core of the webOS device experience will continue to function even if Sunnyvale were to vanish from the planet. Unlike older smartphones, webOS connects directly to the internet - there are no Palm or HP servers you have to go through for your apps to get their content. Go read up on the webOS Survival Guide by WebOS Internals. It's everything you need to know for the eventual webOSpacolypse. Georgia and Rene finish up Mobile Nations Fitness Month by talking about balance. Exercise, nutrition, and sleep are great, but how do you fit them into your hectic work, school, and family life? Find out! CONTEST: Fitness Month Dream Device Giveaway! $400 value, enter NOW!